Legacies provide the foundation stones of a secure future for Clare. Samuel Blythe, who joined the College as an undergraduate in 1652, was elected to the Fellowship in 1658 and served as Master from 1678 to 1713, is perhaps our most well-known legacy donor, after Elizabeth de Clare herself. He generously bequeathed £6,000 when he died in 1713. His gift, now known as the Blythe Fund, makes up a significant proportion of Clare's endowment and will continue to benefit the College and its students in perpetuity. 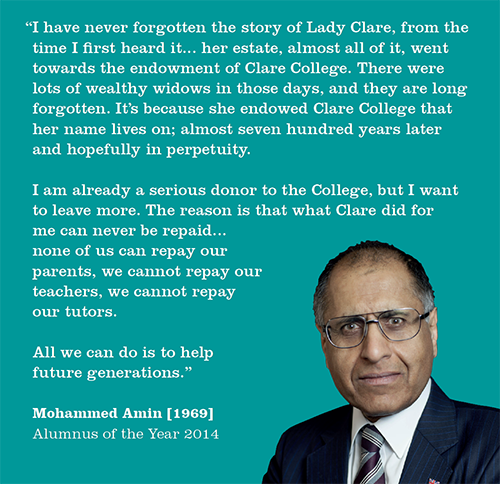 Since 2000, Clare has received almost £6 million from legacy donors. Their gifts have been put to immediate use to support current Clare students, and, like Samuel Blythe’s legacy, they will also enhance the endowment for future generations of students. For many of us, a legacy gift to charity is the most significant donation we will ever make. By choosing to leave a gift to Clare College in your Will, you are helping to ensure the future of an institution that provides the brightest and the best with a world-class education and outstanding opportunities for research and personal growth. At Clare College we are pleased and proud to maintain our relationships with the families and friends of our legators. Family members are welcomed as part of the Clare community and kept updated on College news and events, as well as the positive impact of their loved one's legacy gift. By leaving a legacy to Clare, you will not only be making a lasting contribution to the future of the College and its students, you may also reduce the tax burden levied on your estate, which can benefit your loved ones and other beneficiaries. Since April 2012, if you leave 10% of your net estate to a charity like Clare College, your Inheritance Tax Rate drops from 40% to 36%. All gifts left to charity in a Will are exempt from tax.